We were standing at the stormy river Panj that separates Tajikistan from Afghanistan. We were standing at the stormy river Panj waiting for someone to open the metal gate to the bridge that separates Tajikistan from Afghanistan. It was 8:30 in the morning of a cloudy day and we were excited to see the other side of the river that was the border to the mysterious country Afghanistan. Not many tourists go there and our families thought that we were crazy. 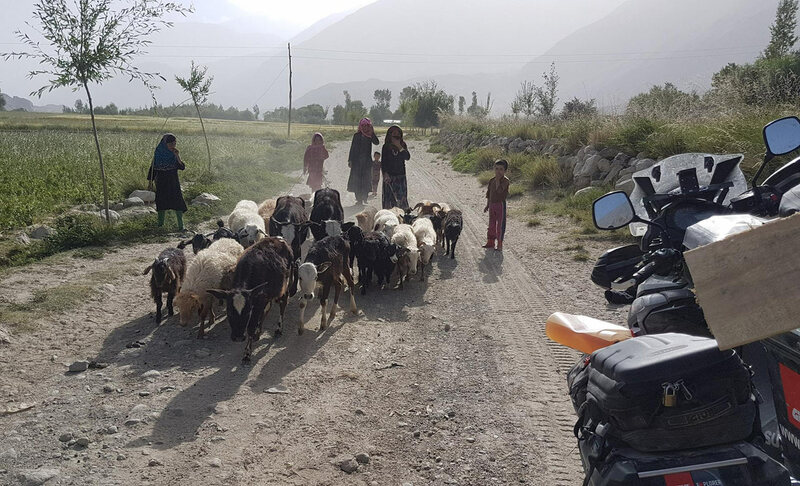 Having talked to many people and authorities like the Afghan consulate or Tajik soldiers we got the same answer everywhere: Wakhan valley is supposed to be safe as there are no Taliban. The rest of the country is not. 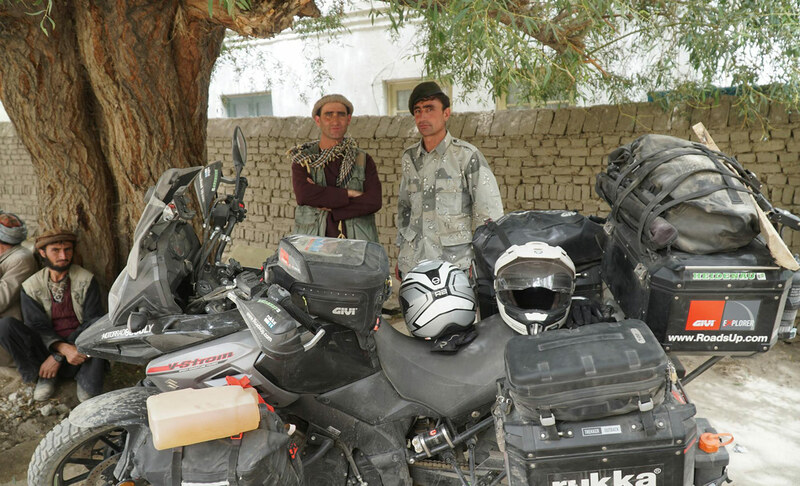 After some time finally two Tajik soldiers appeared and asked if we wanted to cross the border. At our affirmative answer they spoke into their walkie-talkie and two other people without uniform greeted us friendly. They walked over the bridge to the border checkpoint buildings. The metal gate opened for us with a loud sound and we entered the bridge getting a bit nervous as the big door closed behind us. As we went into the fog crossing the first part of the stormy river we saw huge headlamps and even a hangar. On one of the buildings there was a big sign of the European Union and the United Nations saying “International border checkpoint”. As they were checking our documents they found that our motorcycle permit was overdue for a few days. Peter had to go to the bank to pay a “straf” as they called it. One friendly border official wearing a shirt with the letters “San Francisco” even accompanied him sitting on the motorcycle behind Peter as Claudia waited at the border control. The Tajik military was really friendly and Claudia once again got to know Tajik hospitality as they asked “Did you already have breakfast?”, took a stool for her to sit and even brought something to drink. The gate to the Afghan side opened and a familiar guy entered the Tajik side. It was Philipe, a friend from Austria. Happily we greeted each other and he told us about the bad roads condition in Afghanistan. He asked if we were sure to enter with our bike. When the gate opened for us to leave Tajikistan, the soldiers waved us goodbye wishing us all the best. We got a bit nervous as we entered the Afghan checkpoint. 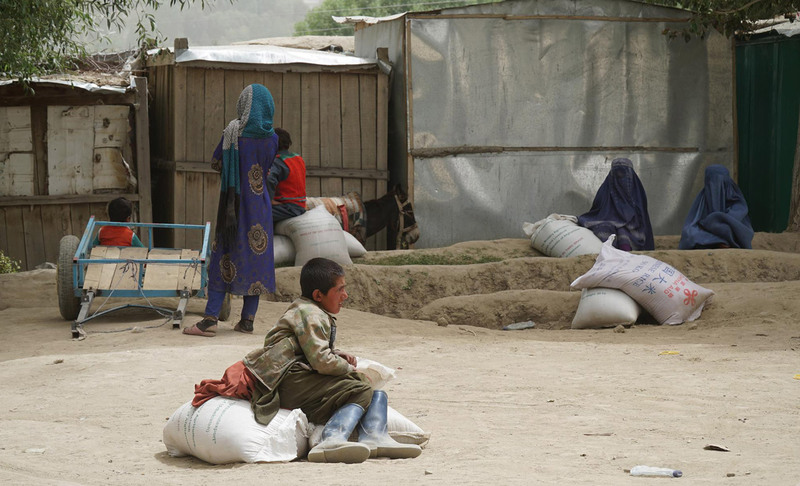 “Hello, my friends, welcome to Afghanistan” – a black haired man wearing a long shirt and loose trousers greeted us. It was Safi Usmani, our guide to help us with the border formalities and permits. We were really happy to have him with us in this foreign environment. The border building was much smaller than the one on the Tajik side but there were more soldiers standing around looking curiously at our motorbike. What is your name? What is your father`s name? Where are you from? Are you married? While we were answering the questions we counted nine officials standing around the motorbike. Thanks to our guide and his companion, the principle of the local school, we managed to do all formalities very quickly and were soon free to go. On the one hand we were really excited that we finally made it, on the other hand we were quite nervous because we didn`t know what would await us. As we followed the car of our two new friends we caught a first glimpse of the country. There were children riding donkeys, bearded men wearing typical Afghan clothes and women covered completely with a blue Burka. It was quite shocking to not even see their eyes and facial expression. 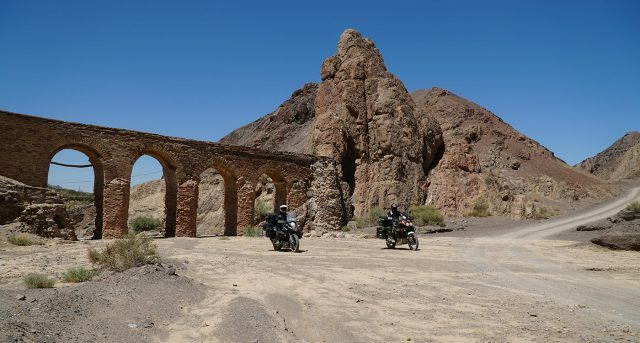 After about ten minutes riding on a stony dusty road we arrived at the first official building where we could get our registration. 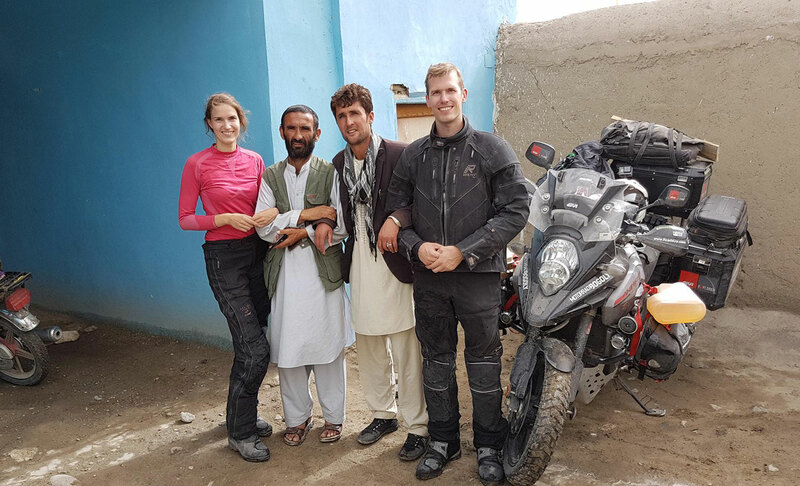 Peter and the two Afghan men went inside the building while Claudia waited at the motorcycle. Very soon there was a huge crowd standing around staring at Claudia and the bike. 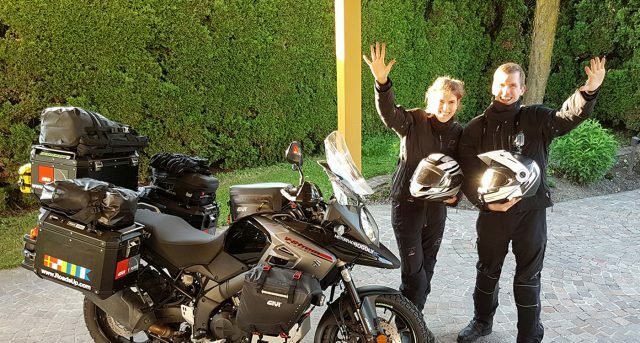 She was feeling a bit uncomfortable and didn`t dare to take off the motorcycle helmet at first. The square looked like a film-set of a medieval movie. 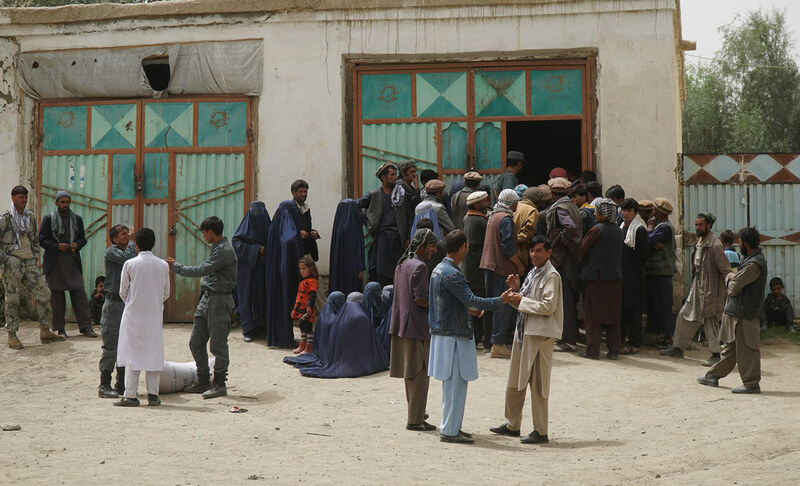 Bearded men in traditional loose clothes and a few women in blue Burkas were standing and waiting to get a 50 kg bag of rice from the government. After some time Peter came looking for her and reassured her to take off the helmet. At that moment Claudia was really thankful for his presence. Already being midday Safi led us to a nice restaurant for lunch. A few men were sitting on the floor eating food with their hands. The television showed a midday prayer broadcasted from Mecca. They served very good rice with beans and bread. 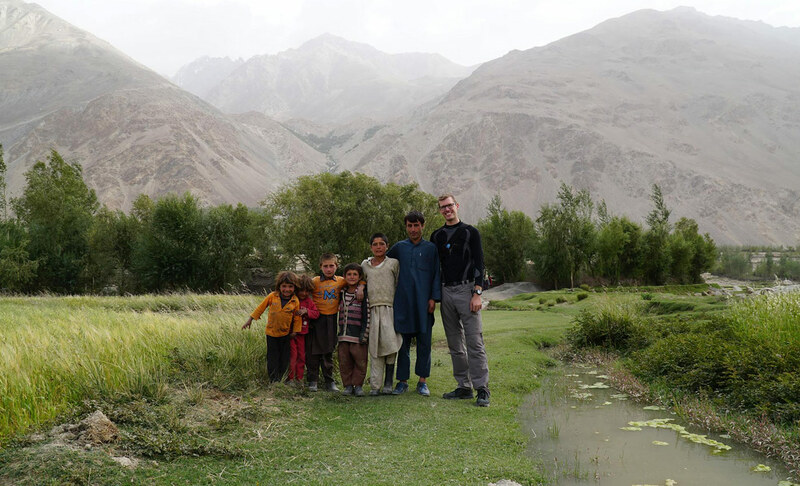 Safi and his friend also helped us exchanging money, making copies of our passports and getting our permits for Wakhan. 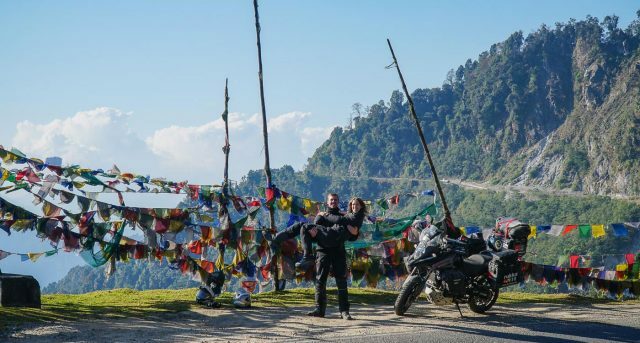 The two of them riding on a small motorcycle showed us the way to a guesthouse. The road was really bad with a few watercrossings and sandy passages. We arrived at Wafi`s guesthouse where there was a cosy living room and a separate room for us. Drinking tea together Safi patiently answered our questions about the country and especially the Wakhan valley. 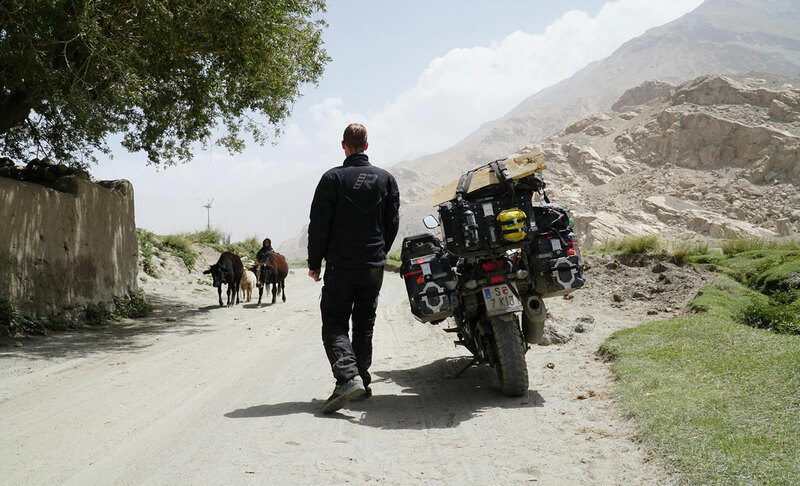 Later in the evening three men from the Wakhan valley arrived. We had a very good time together talking about the region, the differences to the rest of Afghanistan and the Aga Khan society they were working for. It is an NGO with headquarters in Geneva that provides medical, educational and general help for the development of the region. 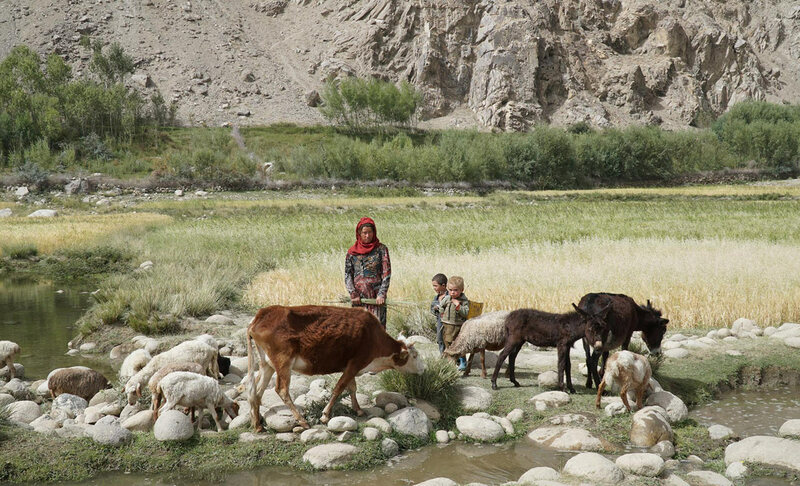 People in the Wakhan valley are also different from the other people in Afghanistan as they practice another form of Islam. The women are also working outside the house so they are more independent. Being tired we went to bed and fell asleep soon afterwards thinking about this unique country. 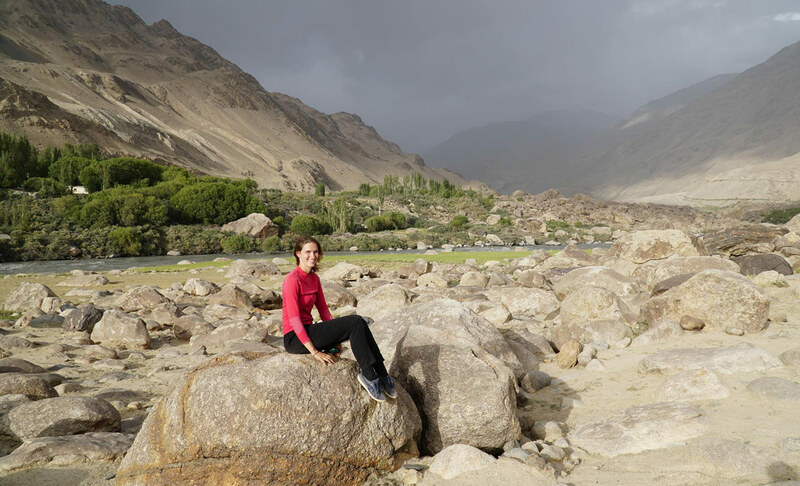 On the next morning we got up early and left soon after breakfast towards Wakhan valley. The road on the Afghan side of the valley was hard to drive. We heard that even four-wheel cars got stuck regularly. 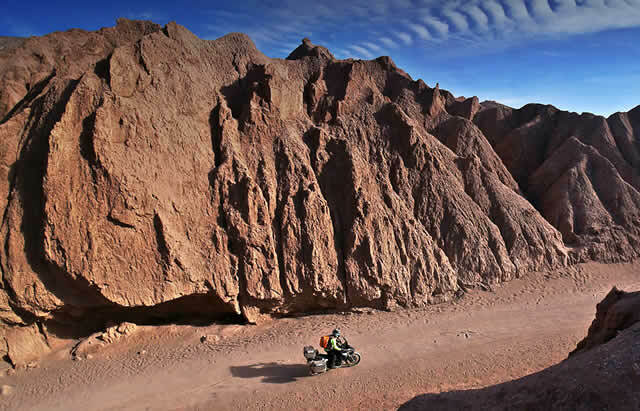 It was a mixture of deep sand, water crossings, big stones and small stones that behaved like sand. 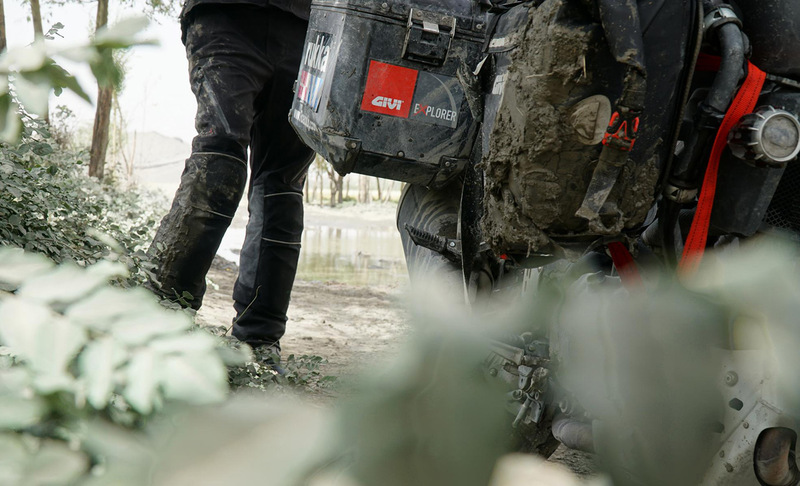 During an especially deep and about 20 meters long mud hole filled with water the motorcycle slipped and got stuck in the mud. 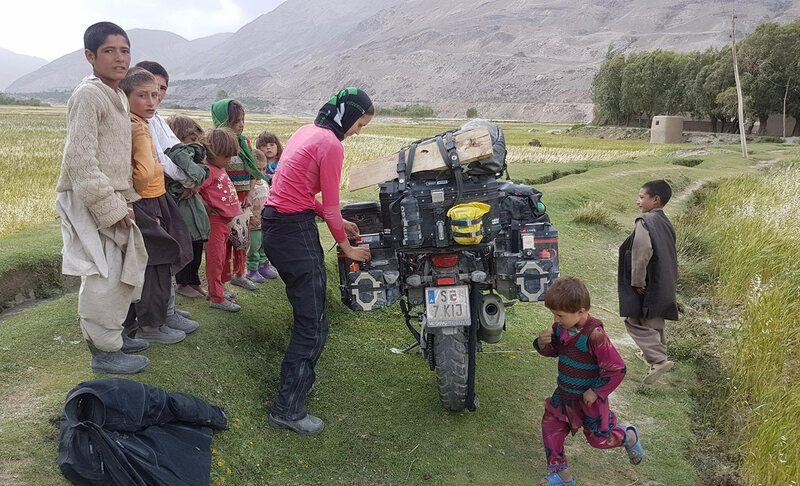 Thankfully Afghan people are very helpful, as a car held immediately and two men in sandals jumped out into the mud and helped us lift the bike. Soon after we left Ishkashim we saw women on the street wearing colorful clothes still wearing a scarf but without hiding their faces. 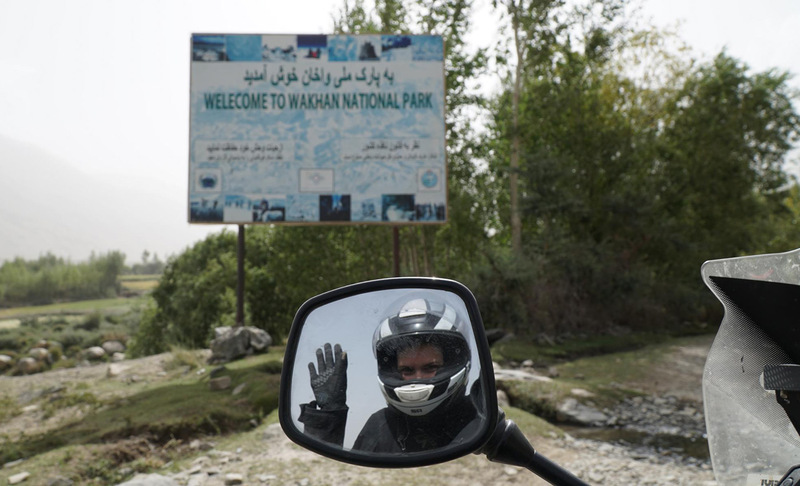 We saw no one wearing a Burka in the whole Wakhan valley. During a small break a well-dressed man in blue traditional clothes and fitting blue shoes came by and asked in very good English if he could invite us to a cup of tea in his house. 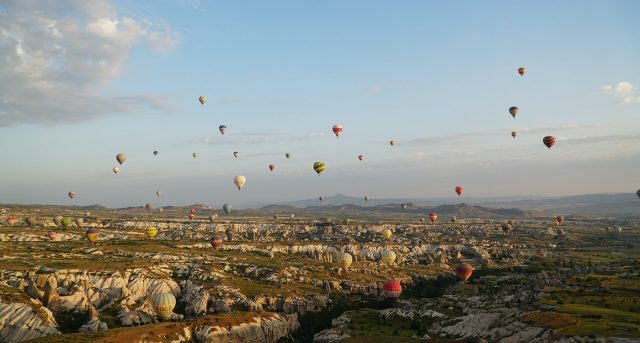 We think that the best thing about travelling is to get in contact with locals, so we happily accepted the invitation. We followed him through the grass along a small river to his house where children were playing. He showed us a room with carpets and pillows on the floor where we could sit down. Uncles, brothers, cousins, wife and children all lived together in one house. Together with two uncles we drank some tea. Wanting to be really friendly they served us our tea with so much sugar that we wondered if we could drink it anymore. Both were wearing the typical Afghan hat. It was a present from former president Massoud, who stood up against the Taliban. 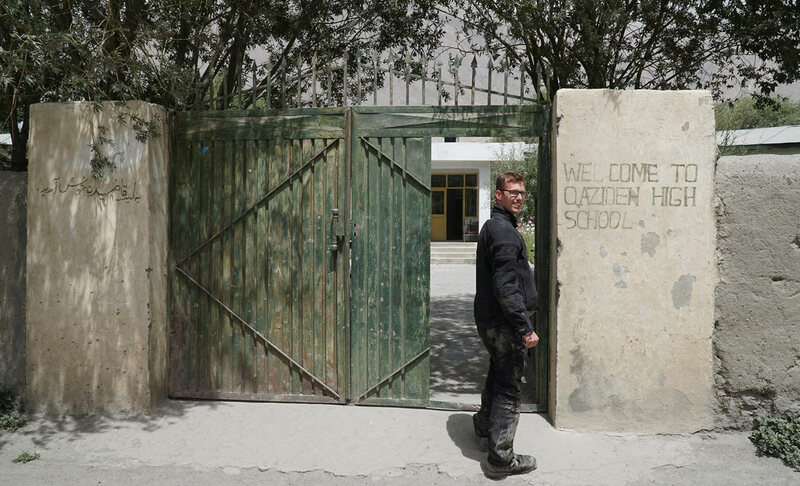 All the people we met in the Wakhan valley despised them. Our host named Shahsayeed was not only a high school teacher but also the principle of the school and supervisor of many other schools in the region. He invited us to stay the night at his place. We went to bring the motorcycle, that was parked on the main road, to his house. It turned out to be a really difficult task as there was only a small piece of grass while on the left side there was a stream and on the right side there was a small downward slope. Unfortunately the front tire slipped to the left and got stuck in the small river bed. Soon many children stood around the bike watching curiously. “No problem”, Shahsayeed said and ran to his house to grab a big trunk. Placing it next to the front tire the two uncles, Shahsayeed and Peter heaved the front of the bike onto the wood then the back tire onto the grass again. Back at the house our friendly host suggested to take a walk together. He showed us his beautiful gardens where weed, beans and potatoes were planted. All the time we had a spectacular view at the mountains in every direction. 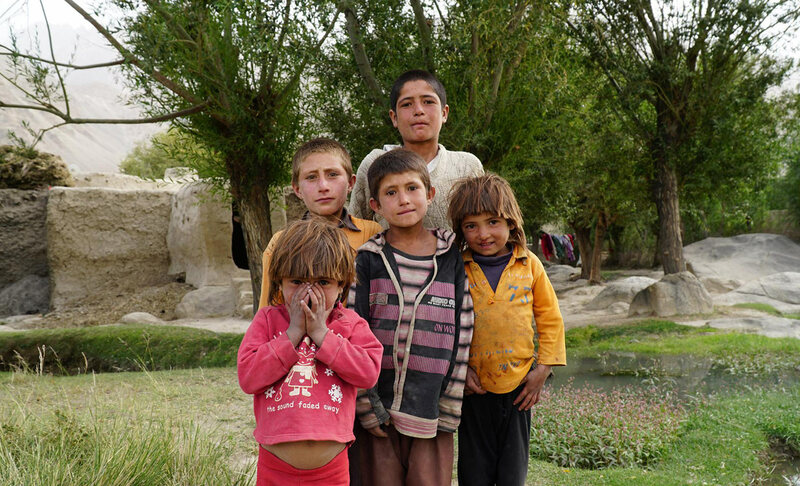 We went very close to the river Panj so we could take a look at Tajikistan. It was a surreal experience standing on the other side of the river. 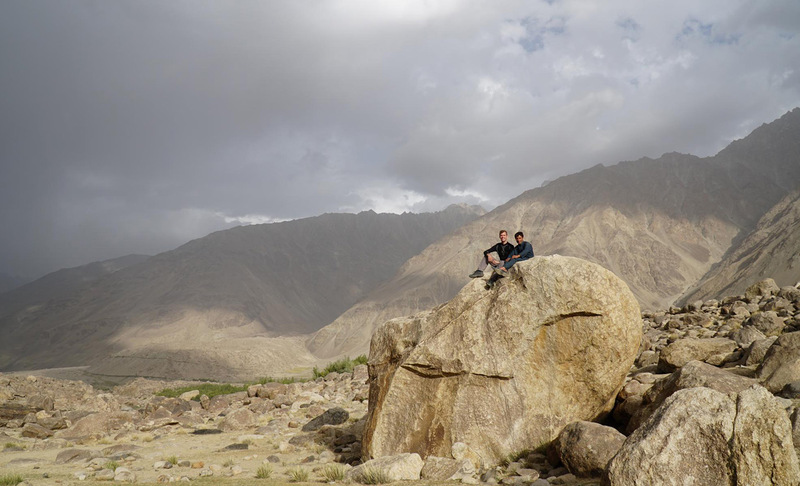 During the last weeks we always watched the Afghan side closely, being fascinated by the country. While taking many pictures, enjoying the great view and having good conversations the time flew by so we went back to his house. Later his younger brother, also a teacher, came by. He was wearing a jacket, as he came from the neighbor village where a person had died. 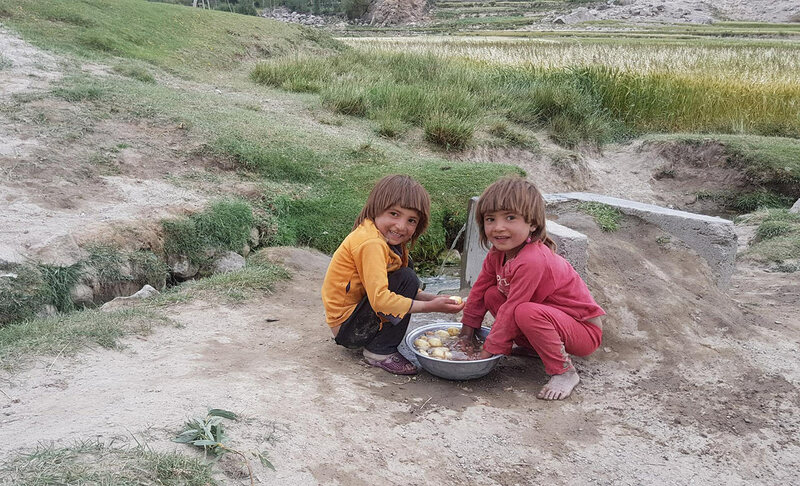 We learned that their mother language is not Farsi like in the rest of the country, but Wakhi language. It even has a different alphabet. They understand Farsi perfectly well so many people who have television watch Tajik programs. As it is very cold and snowy in winter, school starts in March and ends in November. 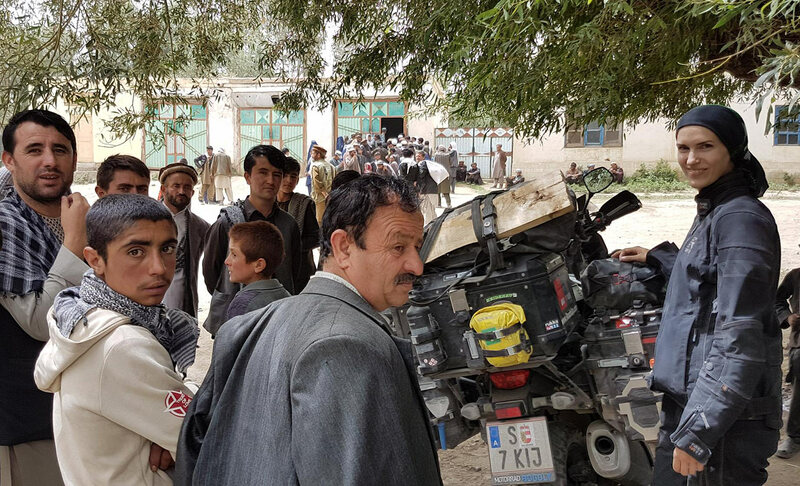 Boys and girls are together in one class, unthinkable in the rest of Afghanistan. 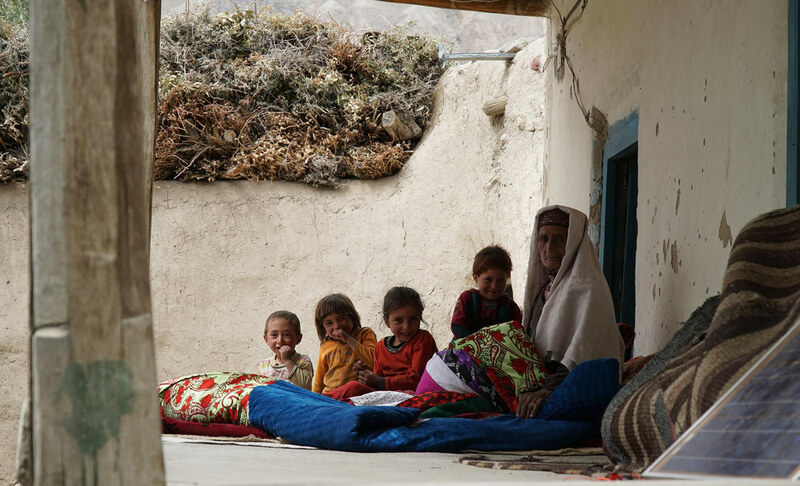 People live very secluded in Wakhan valley, as there is no internet connection outside Sultan-Ishkashim. No postal system and no phone connection are working. Some people use Tajik sim cards but they often get switched off by the Tajik providers. Our new friend served us a delicious dinner with rice, chive, potatoes and carrots in the evening. He even thought to bring us extra plates and spoons and also ate with a spoon to make us feel like at home. Normally people in this area, like in many other countries, eat with their hands. It was the perfect end of an exciting day. On the next day we woke up early to the distinctive sound of a donkey. In Afghanistan the sun rises at about 4:30 in the morning and sets around 7:00 in the evening in summer. That is because the time difference to middle European time is just 2,5 hours. 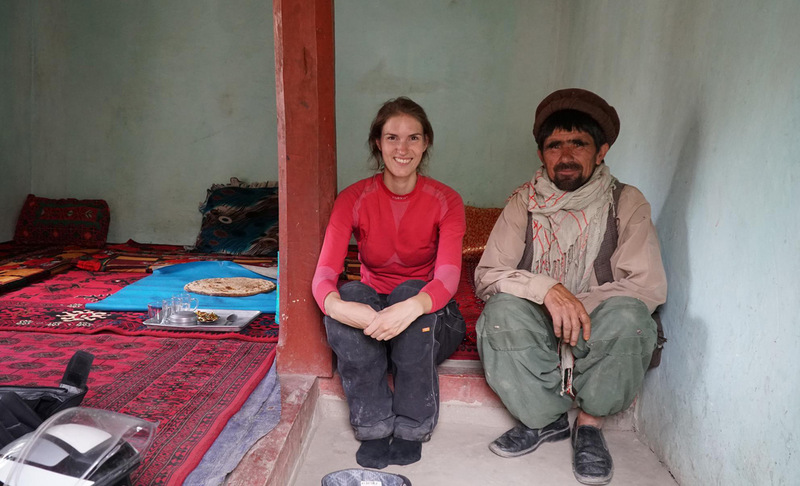 Our friendly host greeted us at 6 o`clock in the morning with a typical breakfast containing black tea with milk, bread and eggs. The first challenge of the day was to get the motorcycle back on the main road without falling into the river. With the help of 4 men and a group of children watching excitedly we managed the task. The road that we were riding afterwards reminded us of a computer game where you have to overcome obstacles to reach the next level. We crossed rivers on small tree trunks instead of bridges, slippery mudholes filled with water, big stones and sandy passages as we came to a river with very big slippery stones underneath the water. 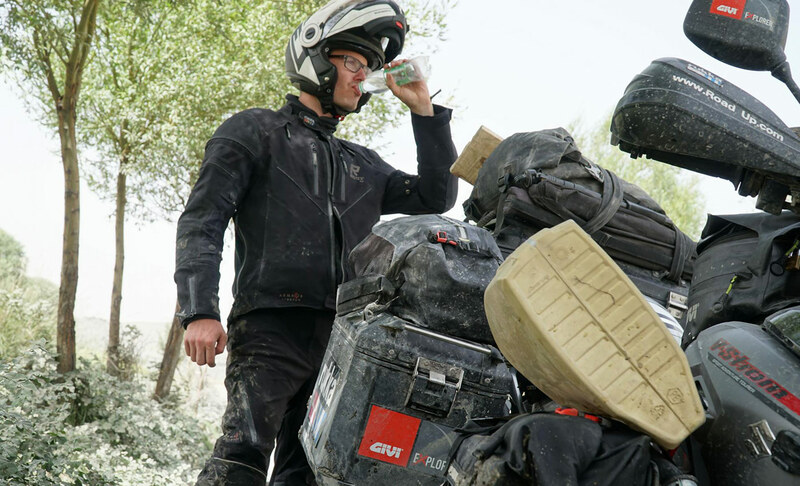 Peter sped up the bike and managed to cross the river as both tires left the ground for a second. Luckily he didn`t fall. 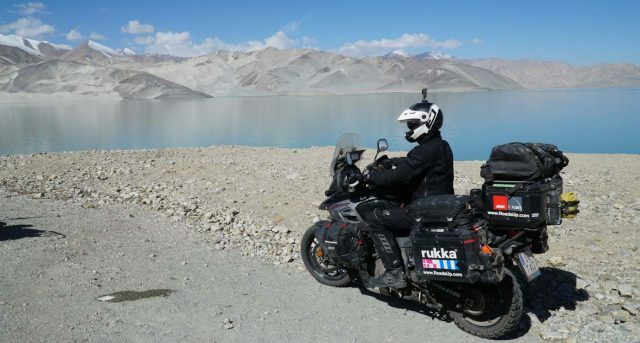 We admired the beautiful scenery with mountains rose high into the sky, glittering rivers and green grass as we suddenly came to a stop because the rear tire felt strange. Getting off the bike we saw that the rim was bent so no air would stay inside the tire. That`s it, we thought. 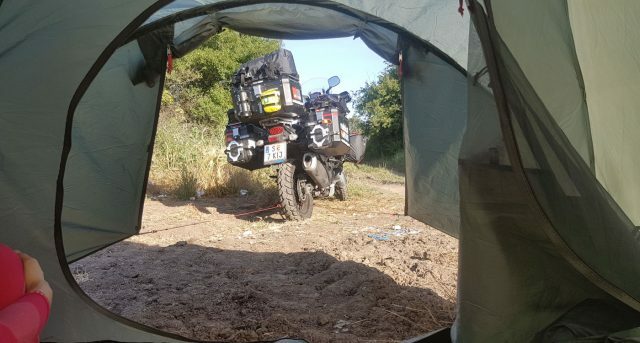 Sitting in the shade and looking at the bike we felt disappointed that we were not able to continue our Afghanistan adventure with our otherwise perfectly running Suzuki V-Strom motorbike. 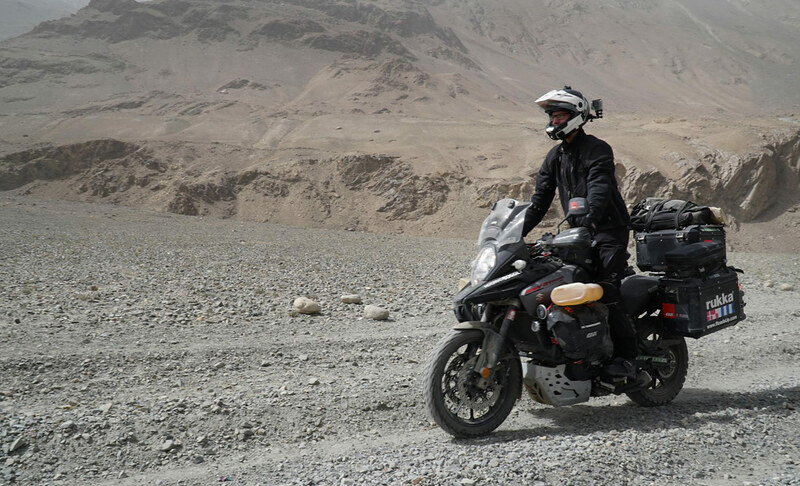 First we had to bring the bike back to Tajikistan. 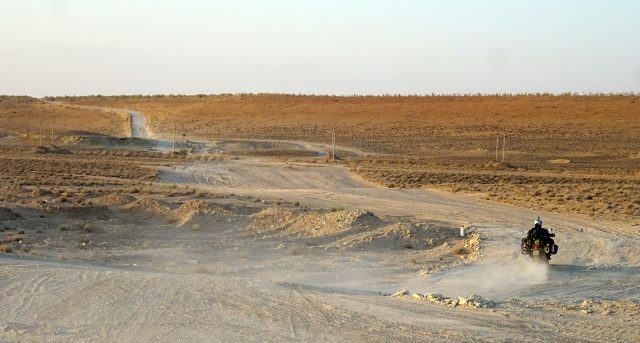 How could we find an empty truck in a remote area of Afghanistan without phone connection? Fortunately we had a satellite phone with us so we could contact Safi Usmani. During the first hour of waiting not a single car came by. Instead some children with sheep, cows and goats passed by. Then a group of men wearing traditional clothes and hats came around. Everyone was really friendly and wanted to help, but wasn`t able to. Safi had promised to send us someone with a truck but we didn`t know when or from which direction. When finally an empty truck came by we were really happy and relieved. 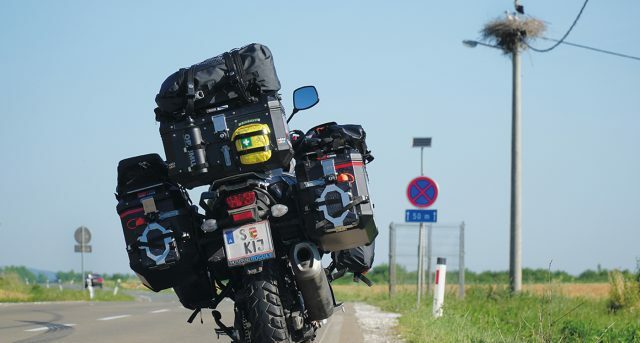 But at first we had to put the 250 kg motorcycle on a truck without a ramp. 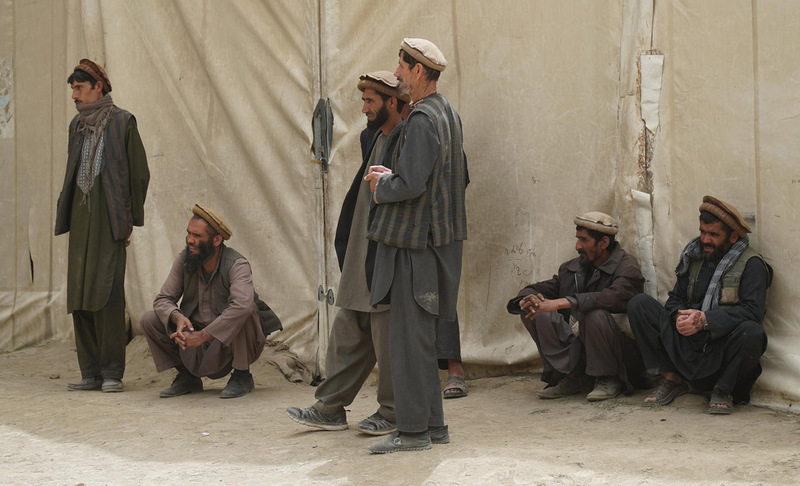 Being in Afghanistan it wasn`t a problem at all to find seven strong men willing to help. As we were sitting in the vehicle listening to Afghan music another truck drove beside us and waved at us to stop. “Safi Usmani?” The driver asked. Soon it became clear that he was the one sent to help us. There were about 20 men with some donkeys standing aside watching us as we tried to find a solution. At first we thought we wouldn`t find a truck at all, now we had two willing to take us. We finally agreed that we would pay both and went on towards Ishkashim. At the border a soldier stopped us and we tried to explain our situation. He looked at our bike and told us to remove it from the truck. Peter had a better idea and took paper and pen to explain his plan. The soldier laughed and told us to wait. After some time he came back and said it wouldn`t be a problem for him as long as the Tajik soldiers agreed. We remembered them to be very friendly so we hoped for the best. He lowered the chain and the truck with us and the bike was allowed to turn around and cross the first part of the border going backwards. We were greeted by the soldiers and once again had to show our passport. The procedure was very quick so we soon stood at the closed fence to the Tajik side. Obviously there was no one there. Afghan soldiers told us that we were the only ones crossing that day so the Tajik soldiers had to come to the border buildings just for us. Fortunately they agreed to organize a truck for us and had fun with the Afghan soldiers. A blue old Russian truck that looked taken out of a Soviet museum appeared. 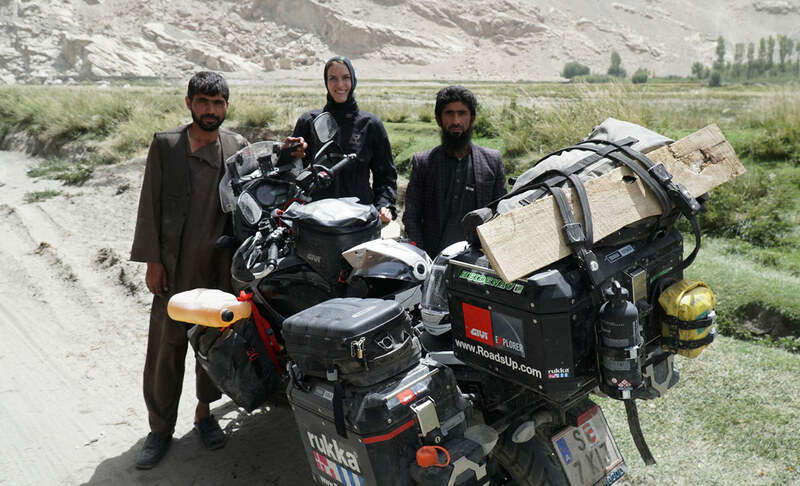 The two vehicles turned their back to each other so we could move the motorcycle from one to the other from Afghanistan to Tajikistan. Astonishingly they fit together perfectly with less than a centimeter difference in height. The same road we thought was bad only a week before suddenly appeared like the best road on earth compared to the one on the Afghan side. In the guesthouse we were happy about “normal” toilets and showers. Summing up, Afghanistan was an unforgettable adventure and definitely worth a visit.